Hitech City peeps, are you in a constant dilemma on what to eat and where to go after work? Then we got just the thing for you. With unusual fusion food to regular nibbles, these cafes and restaurants of Hitech City are sure to delight the foodie in you. So, let’s get to making plans (and stuffing your faces) with your cronies. We got to admit – Hoppipola’s new menu is an exciting mix of east meets west with things like Peri Peri Biryani, Chicken Sanskari Tacos, Maggi Missiles etc. While the Peri Peri Biryani is a spicy biryani rice with chunks of chicken well-cooked in peri peri sauce (served along with mayo instead of raita), the Chicken Sanskari Tacos are tacos stuffed with chicken tikka, onion laccha, capsicum, and mint chutney. 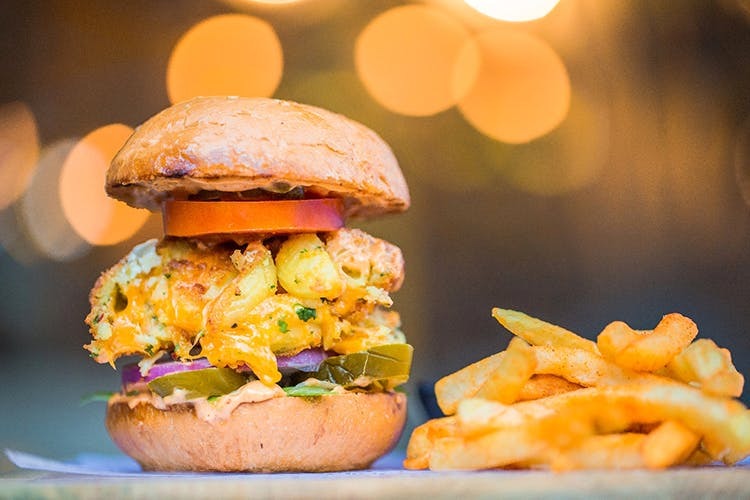 If you’re interested in trying something whacky, go for the Mac & Cheese Burger or Murgh Tikka Nangles, baked naan triangles topped with chicken tikka. What we’re really loving here are the drinks, though. You can score a Cosmopolitan or a Bloody Mary at INR 99 from their 99 drinks menu which has plenty of other drink deals too. So, go here for some cray food varieties, drink deals, and music! Want to see a little bit of Goa in Hyderabad? Then 84 Anjuna Shack is where you must go with your squad. Done in a laidback ambiance with a seating that comprises basic (yet cushy) bamboo chairs, you will also stumble upon a flea market with apparel, jewellery, chappal etc. Whether you are in the mood for waffles or pasta, this shack has a little something for every food lover. But we recommend the Spicy Goan Wings, which are juicy and finger-licking good. Plus, you cannot miss out on the Goan thalis like Goan Fish Thali which comes with Fish Rawa Fry, Goan Fish Curry, steam rice, and more. If you love pork, then Goan Pork Thali with Pork Vindaloo, steam rice, kadhi etc. is a must-have. End your meal with Bebinca (a Goan specialty dessert) and go home in joy. Simply South by chef Chalapathi Rao does some of the best South Indian dishes, and if you love your rasam and sambar in the most authentic way, you got to eat here. Offering you the vibes of a true South Indian home, this restaurant will engulf you in its old-world charm with Carnatic music playing in the background. Bringing home the best from five South Indian states (Telangana, Andhra Pradesh, Karnataka, Kerala, Tamilnadu), it also has Hyderabadi specialties like Bagara Baingan, Ambada Kheema etc. We go here for the South Indian Veg Thali which comes with the choicest of dishes – right from Bagara Rice (or any flavoured rice of the day), dal, curries, papad, and more. But if meat is your bae, you can also order for Natu Kodi Pulusu (country chicken cooked with traditional spices in a gravy) or Uragai Mamsam (pickled mutton). Outdoor fiends, here’s a shout out to you from News Cafe. With the view of Durgam Cheruvu, and exciting deals like Vibe Hours (or happy hours), Combo Lunch, and Sushi Specials (where a plate of sushi is priced between INR 399 – INR 1299, depending on your choice), this pub beckons us for all the right reasons. The happy hours start at 12 pm here, and the drinks start at INR 115. But if you’re looking for better deals then hit up the cafe during its closing hour which begins at 9.30pm where you can grab drinks at INR 100 only. In spite of a sluggish service, we love this cafe for its waffles. With more than 10 kinds of sweet waffles, it also has around 14 kinds of waffle savouries (vegetarian and non-vegetarian included). So, if you don’t like a good old chocolate waffle, you can always go for a Garlic Mushroom Waffle (pan-fried mushrooms are tossed in garlic and fresh herbs and topped on a waffle) or a Blueberry Roasted Chicken Waffle (chicken roasted in a blueberry sauce is topped on a waffle along with more blueberry sauce). Plenty of pancakes and crêpes will keep you hooked to the cafe. For us, the Blueberry Banana Smoothie and waffles have casted a magic spell on us and we cannot stop going back.